I absolutely loved this book. Ambrose is, of course, one of the most popular writers of American history and his books are often best-sellers. Undaunted Courage is one of his most popular works and there is ample evidence throughout as to why. 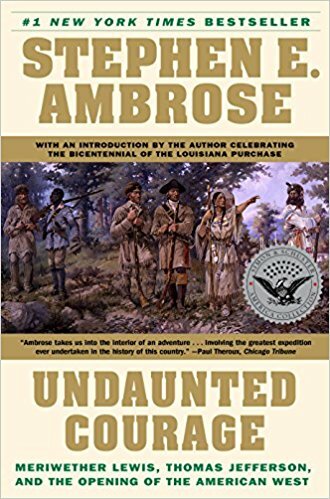 Of course, Ambrose has absolutely wonderful source material in The Journals of Lewis and Clark, but he manages to edit and distribute their voluminous notes into a narrative structure that is undeniably riveting from start to finish. Their journey to find the elusive Northwest Passage and to obtain scientific and natural specimens and maps of land previously unknown to science is an endlessly entertaining adventure story filled with exploration, heroism, unimaginable hardship and astounding beauty. The vivid descriptions of the wildlife and terrain of the virgin West, populated by warring Indian tribes and bountiful herds of Bison, is at once breathtaking and heartbreaking for we know what’s to come as both the Indian tribes and Bison are hunted and killed to near extinction over the next century. After having completed the Louisiana purchase from Napolean for the bargain price of $15 million dollars, Jefferson wanted to know just want he had in these 825,000 sq. miles. And so, in July of 1803 he tasked Merriweather Lewis to look for an all-water route across the western two-thirds of the continent. According to Ambrose, Jefferson’s attitude toward Indians was the exact opposite of his attitude toward his black slaves. He thought of Indians as “noble savages” who could be civilized as full citizens. And so Lewis and Clark set off with their boats laden with “presents” for the various tribes they would come across along the way. These presents were meant to act as enticements for help in navigating the wilds but more often than not the tribes they came across were far more interested in their whiskey and guns. As the team, some thirty men in all (plus Sacagawea) made their way, often upstream in their cavalcade of keelboats and pirogues, they come across and endless array of Indian tribes, landscapes, obstacles, violent animals and storms. I was amazed by not only the fortitude and loyalty of the expedition, but the leadership of both Lewis and Clark, two smart and driven men who seem not to have disagreed to any significant degree throughout the nearly 2.5-year journey. Lewis got out his pistols. He loaded them and at some time during the early hours of October 11 shot himself in the head. The ball only grazed his skull. He fell heavily to the floor. Mrs. Grinder heard him exclaim, “O Lord!” Lewis rose, took up his other pistol, and shot himself in his breast. The ball entered and passed downward through his body, to emerge low down on his backbone. He survived the second shot, staggered to the door of his room, and called out, “O madam! Give me some water, and heal my wounds.” Lewis staggered outside, fell, crawled for some distance, raised himself by the side of a tree, then staggered back to his room. He scraped the bucket with a gourd for water, but the bucket was empty. He collapsed on his robes. I thoroughly enjoyed this book and it has fundamentally changed the way I perceive and think about the West. Highly recommended.